Short selling scares people. Many advisors categorise long/short strategies as ‘risky’ and they have support from the likes of Warren Buffett who describes it as dangerous and irritating. Our observations show long/short strategies do in fact give skillful managers a competitive advantage. There are certainly risks associated with short selling. For one, the share market goes up a lot more than it goes down. Being short is therefore swimming against the tide. When markets rise due to macro factors such as lower interest rates, or tax cuts, all businesses benefit and short positions lose money. Being ‘short’ a company exposes investors to unlimited losses, because a company’s share price can rise forever, apparently. The maximum gain is limited to 100%! Businesses which are struggling for whatever reason attract short sellers but may also become take-over targets, with the acquirer usually offering a significant premium to the prevailing share price, and short sellers get burned. Adding short positions to a portfolio of equities adds a different risk, but like many things which are difficult, it also adds another level of potential performance in the hands of a skilled manager. Just as adding power to a Formula One car adds risk, a highly skilled driver can manage that risk, and achieve the desired outcome of better performance. Jim Chanos, a renowned short seller believes short selling is personality based. “There is a big difference between being a long-focused value investor and a good short seller. The psychology is completely different” says Chanos. Our experience supports these observations. We acknowledge that short selling is difficult and the risk is asymmetric in a bad way, but we also know some managers have the right temperament and thought processes to be very good at it, and it adds an important competitive advantage to their funds. There are few long/short funds offered in NZ, but there are more than 90 in Australia alone, which focus primarily on Australian and NZ equities. If short selling is ‘extremely risky’, you would expect these funds to on average generate inferior ‘risk adjusted returns’ than long only funds. One measure which is typically used to rank a fund’s risk adjusted returns is “alpha”, which compares a fund’s performance to its equity benchmark after adjusting for volatility. If short selling is extremely risky, you would expect it to elevate the risk of funds which employ short selling over those which do not. Based on this simple test, our research shows that this is not the case. 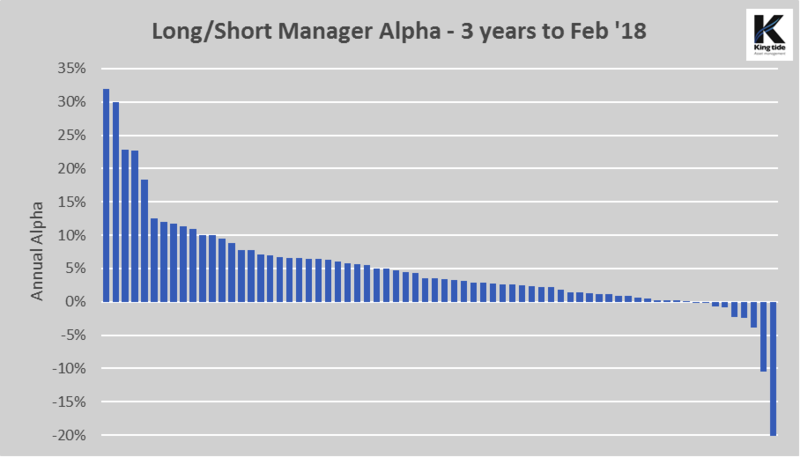 The average long/short fund on our database, (we cover every long/short fund we know of in the Australian and NZ market) has delivered higher returns than the market, with less volatility, generating significant alpha as a result. Of the 70 funds which have been going for three years or more as at Feb 28, 2018, 50 of them beat the market in absolute terms, net of all fees. Of those 50, only 2 did not generate positive annualised alpha, while out of the 20 funds which underperformed the market in absolute terms, 10 of them produced positive alpha. Only 10 funds out of 70 underperformed on a risk adjusted basis. These are hardly the results you would expect from a strategy which heightens risk. Overall, the universe of long/short funds generated average returns well above those of the market, with less volatility. Of course, the sceptics will point at the long/short funds which have failed, closed and dropped out of the data. We have seen a number of long/short funds fail over the years. However, we have seen just one example of excessive short exposure leading to heavy losses. Failures have generally been due to leverage combined with poor stock selection on the long side. Most funds in this sector which close do so because of low relative returns rather than large negative returns. We believe the ability to short sell as a part of an overall equity strategy is a competitive advantage, and the results confirm this. One of the key benefits of having a portfolio of long and short positions is that you lower market risk. A long only portfolio is fully exposed to negative ‘market events’ such as higher interest rates, trade wars, geopolitical tension, regulatory changes, or negative investor sentiment. Gains on your short book help offset the losses on the long side, resulting in outperformance in down markets. Short selling can also be used to take advantage of negative trends from industry disruption like pay TV, newspapers, telecommunications, energy, on-line shopping, as well as sector rotation in and out of cyclicals like commodities, listed property and property related industries to name a few. Some managers use shorts as hedges against ‘market exposure’ or as a means of funding larger positions in their long book. If you short a market beta stock, obviously one which you’re not long, you get the cash from the short sale and can use that to leverage your long book. While adding to your stock specific risk, it doesn’t add market risk. There are many different ways managers use short selling. Some will match stocks in similar businesses against one another, building a portfolio of pairs. Their success depends on their longs outperforming their shorts, regardless of the direction of the market. Others will search for businesses they genuinely believe will fall in price. One manager we invest with can hold short positions for years, managing position size to stay the course. There are as many different approaches to managing a portfolio with long and short positions as there are funds, but most of them boil down to the manager’s ability to accurately value businesses and be able to manage the risks associated with shorting. It seems logical that a manager who is able to identify undervalued or high-quality businesses will also be able to identify overvalued or low-quality businesses. Combining the two can result in a much better outcome for investors.